I have been blogging sporadically these days and I don't completely know why. Well, I do know why and it involves badness and sadness and a little pain here and there but I won't bore you with the details. But life goes on and we have to eat. And the holidays come around and we have to eat sweets. Back in December of last year I participated in Sugar High Friday, a monthly blog event started by Domestic Goddess and hosted by various bloggers across the blogosphere. The theme last year was sugar art and, while I was not particularly artistic, I was creative and brave enough to do something I do not usually do: improvise with a baking recipe. I was actually quite pleased with the resultant Pomegranate Kisses, about which you can read here. And then I kind of dropped out of blogging events. I did make something for one other SHF event, but the results were underwhelming, and my post has been languishing in draft mode for almost a year now. I suppose it will languish for a while longer before I get around to it. Now that I have started posting more regularly again, I thought I might drop in on Is My Blog Burning and check out the blog events to see if there were any in which I might want to participate. I'm thinking it might help me stay motivated to post more frequently if I have some challenges and deadlines to meet. I was quite delighted to see that this month's Sugar High Friday, hosted by Zorra at Kochtopf, is dedicated to pudding. Pudding is one of my all-time favorite desserts, but I rarely have it unless it is on the dessert menu at a restaurant. The ready-made puddings that you can buy at the grocery store are not really what I consider to be pudding. They are really just artificially flavored, artificially thickened sauces that just do not have that thick, rich creamy mouthfeel that a real bona fide made from scratch and thickened with egg yolks pudding provides. That being said, I had never made pudding from scratch before and was slightly hesitant about my ability to do so. I had, however, pulled a recipe for Rich and Creamy Butterscotch Pudding from the January '07 issue of Food and Wine magazine. I love anything butterscotch. It's another one of those things that, if it's on the menu, I'm going to order it. No matter how double-triple-or quadruple the chocolate, how mocha the mousse, how lava-like the center, nothing comes close to the luscious buttery caramel-ly creamy scotchy richness of butterscotch pudding. So when I saw that the theme for this month was pudding, I knew I had to give it a try. I was a little nervous because I do not have that much experience with puddings and custards and the like, although I did make my friend Bob a fruit tart for his birthday a few years ago that, while it did not exactly look perfect, did taste the way a fruit tart should taste (thanks to Barefoot Contessa Ina Garten, whose recipe it was). But what are blog events for if not to give us reasons to stretch our reach that little bit further? So I went to the grocery store fully intending to buy all the ingredients necessary for butterscotch pudding. And had everything I needed until I got to the baking aisle and found only one brand of butterscotch chips available. And that brand was artificially flavored. What to do? I really really really wanted to make butterscotch pudding. I really really really did not want to use artificially flavored butterscotch for a SHF blog event! The thought did cross my mind that I might try to make some from scratch, but I quickly (and wisely) squelched that thought. Instead, I opted for white chocolate chips and decided to take a stab at making a butterscotch sauce from scratch to go with it. I found a recipe that looked good at Recipezaar. I was pleased overall with the end result. The white chocolate pudding was incredibly rich and creamy, and the butterscotch sauce was a nice foil, although it was a little strong. It called for light brown sugar and all I had was dark. I did not think it would make that much of a difference but I was wrong. The molasses in the sugar was a little too overpowering for the more subtle butter/scotch combination and I will definitely use light next time I make this. Fill a medium bowl with ice water. Set a fine mesh sieve in another medium bowl; set the bowl in the ice water bath. In a small skillet, combine 1-1/2 Tbsp of the cream with the Scotch, brown sugar, water and salt and cook over moderate heat just until the sugar is dissolved. Let cool slightly. Put the egg yolks in a medium bowl. In a heavy medium saucepan, bring the remaining 3-1/2 cups of cream to a simmer with the vanilla bean and seeds. Remove from the heat. Add the butterscotch chips to the hot cream and let stand until melted, 2 to 3 minutes. Whisk until smooth. Gradually add the hot butterscotch mixture to the egg yolks, whisking constantly. Return the mixture to the saucepan and cook over low heat, stirring costantly with a heatproof rubber spatula, until thick, about 15 minutes. Do not let it boil. Strain the pudding into the bowl in the ice bath and stir in the Scotch mixture. Pour the pudding into glasses and refrigerate until thorouthly set, at least 4 hours or overnight. 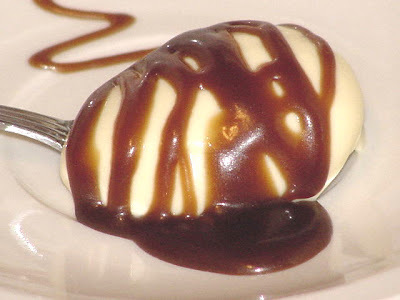 Serve the pudding Scotch Butterscotch Sauce. Slightly adapted from Food and Wine Magazine, January 2007. In a medium saucepan, bring the sugar, cream, butter and corn syrup to a boil over medium heat stirring constantly. Lower heat and boil gently, stirring often, until sauce thickens and coats the back of a wooden spoon. Remove from heat and stir in whiskey and vanilla. Allow to cool slightly before serving. Can be refrigerated up to one week; warm gently before serving. I love white chocolate and butterscotch too, so your recipe comes on my to-do-list. Thank you for participating in SHF and merry Christmas to you and your family.